Flexibility is by far the most important factor with auxiliary body armor; which we achieve with our Abdomen Ballistic System. The pouch is user adjustable for proper placement and creates a natural pivot point with AR500 Armor® Level III hard or IIIA soft ABS body armor inserts installed. 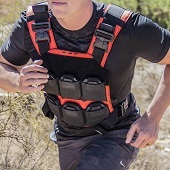 This pivot point is designed to enable the ABS to flex independently of the plate carrier, allowing for unhindered articulation while moving, kneeling, and changing positions.